Thank you for volunteering with the STSA Audio/Visual team! The A/V team plays a crucial role in creating an extraordinary experience during the Liturgy and The Well. This manual will guide you through the process of setting up and operating the A/V equipment. We constantly strive to improve our processes, so if you have any comments or suggestions on how to improve this manual and/or set-up process, we encourage you to let us know! The equipment is brought up from the trailer each Sunday and brought into the room. After set up, dollies and empty cases are left outside the front right exit door of the auditorium. They are wheeled back for pack-up after the Well is finished. Fr. Anthony’s devices should be put back into his backpack. Liturgy set up begins as early as 7:00am. 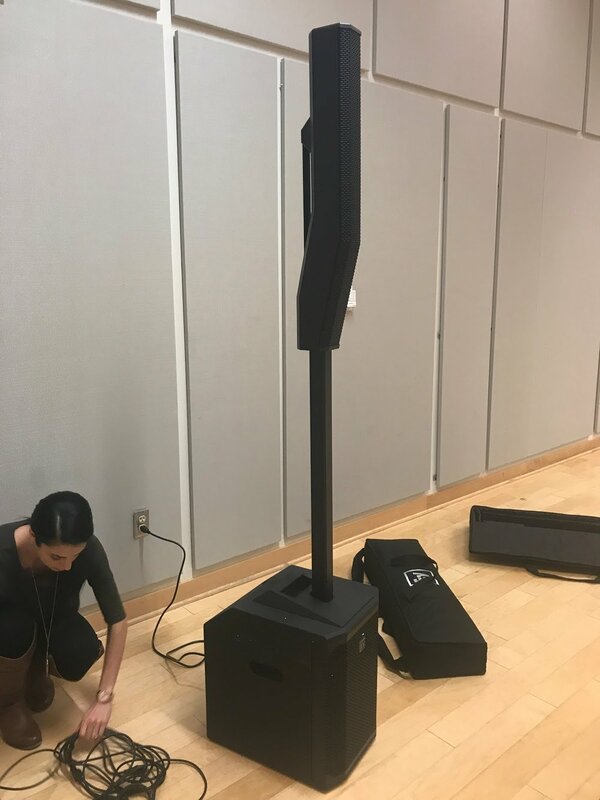 The equipment is brought up from the trailer and usually placed in its appropriate place in the room, but should be connected and powered on by the AV volunteer. Stand case on its side and place case so that input connection area faces the outside of the stage. Remove power strip from inside the box and plug into the wall. Connect power cable to power strip. Plug in Side Speaker audio cords into Outputs #7 and 8. Plug in Monitor Speaker audio cord into Output #1. Plug in Control Panel SDI cable into “Primary” Outlet on the back side of the Stage Box. Placed on the back stage facing outward so that controls are accessible. The power cable cane be found in the bottom-left storage space of the box. It is plugged directly into the floor outlet. Turn on power button on the lower, right middle section. Laptop Connection: Two top-right input cables that turn into one audio plug. Stage Box Connection: Reel of black cable. The long end of the cable connects to the primary plug on the back side of the Stage Box. Feed the cable underneath the front stage so there is no tripping when plugging into primary outlet. Unwind the cable towards back stage. Place TV monitor on the table to the left of the front stage facing the Deacons. Plug in the power cable to the power strip stored inside of the stage box. 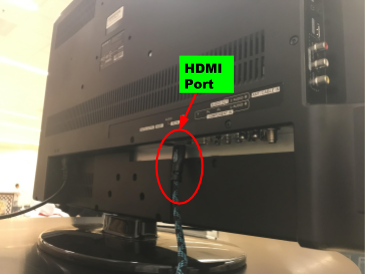 Connect the long HDMI cable (black and blue cable) into the HDMI port of the monitor. Open Boom Mic storage tube by lifting the butterfly clasp on the end of tube and turning clockwise to unlatch. Remove top cover to access the microphone and cable. Place the Boom mic base next to the side of the front altar, in the front of the Deacon seating. Screw mic to the base. Connect 3-hole prong of cable to bottom of mic. Plug power cord into power strip from stage box. Placed on floor against front altar, slightly to the left. Please feed all cables underneath the front stage to prevent tripping. Plug audio cable into Mic1 input on the back of the speaker, then plug other end of the audio cable into Output #1 outlet on the Stage Box. Plug power cable into Stage Box power strip. Press the Power button to turn on the Monitor Speaker. The large cube is the base speaker. The middle connector (long, thin tube) is placed in the base. One of the top cases contain an orange cable - this is the longest cable and should connect to the side speaker on the right side of the altar. Run other end of cables to the Stage Box and plug into Outputs #7 and 8. Connect power cords to outlets. On the right side of the room, plug the power cord into floor outlet to prevent short-circuiting the coffee machines. Turn on both speakers on back bottom base. Plug in the splitter to the back stage power strip. Plug in the three splitter output cables into the HDMI port 1 of the projectors and TV Monitor. HDMI Input is the HDMI cable connecting the laptop. HDMI Out1 is the HDMI cable connecting the first projector. HDMI Out2 is the HDMI cable connecting the second projector. HDMI Out3: is the longest cable and is blue and black. It connects underneath the congregation seats to the TV Monitor on the front stage. Empty each projector case from all cables. Place the projector cases on top of the circular tables on the sides of the Back Stage and place projectors on top of cases as indicated on their label (left and right). Plug in the HDMI cables into HDMI port #1 of each projector and the other ends of the HDMI cables into the HDMI Splitter. Turn on power on both projectors by pressing the “Standby/On” button until a light comes on the LCD screen on the back of the projector. To adjust projector leg height, press down the button on left side as you lift or drop projector to desired height. Adjust the focus on the projector by pressing Focus “+” or “-” buttons to desired setting. To adjust the size of the projection, use the Remote Control. Press “Menu” on the remote, then select “Perfect Fit” → “Execute” (using the side button), then adjust settings using the remote. Alternatively, you can choose the pre-saved “Perfect Fit” setting #2 for each projector. To do this, pull up the menu from the individual projector (not using the remote control or menus will open for both projectors and you will not be able to enter appropriate settings for each). Plug in the laptop to the Control Panel power strip. Find the desktop shortcut for Dropbox: STSA Shared. Once the Liturgy PowerPoint is open, you can search for “Matins” to get to the appropriate slide for service. Press the “Project” button on the laptop to project to the 2 front projection screens and the TV Monitor. Note: If any of the HDMI cables get loose, you should reconnect them before projecting again. Find the clicker stored in Control Panel Box drawer. Slide the USB out from the bottom end of clicker and insert it into the laptop USB port. Turn on the clicker and test to make sure its connected. The clicker can then be passed to the Deacons for the service. The WIFI splitter is connected to the ethernet jack on the back left wall using the long ethernet cable, and then placed on the back stage. The WIFI extender is plugged into the splitter with the short ethernet cable. The WIFI extender power cable is then plugged into the back stage power strip. Once plugged into both power and the splitter, the WIFI extender should turn from blue to teal. This may take a few moments. When WIFI is connected, you can open the MIXLR app on the iPad to start the audio stream. Once live, the audio steam can be found at stsa.church/stream. This is what is used in the Parents Streaming Room in 118. To prevent tripping and cable damage, pass black and blue HDMI cable and SDI audio cable on the reel through the fist chair in each row left to the center aisle and under the front stage, to the TV Monitor and Stage Box. Tape down cables between each chair. Tape down the HDMI Splitter underneath the front of the back stage. Turn up the gain (knob on bottom right corner) to get more people (funnel for the deacons) and lower volume. If there is feedback or whistling noise, turn down the gain. Aux8 is for preselected setting for video. Don’t touch this. Just press it again to turn it off. Immediately after after the liturgy close out the liturgy PowerPoint. Ensure the laptop is connected to the Control Panel and open the “Spotify” application and play music. Open the Announcements PowerPoint and project during coffee hour. At 11:30, pause the music, close the Announcements PowerPoint and open the Well Series PowerPoint and project. A sound check for the music team is performed at 11:20. Before that, please ensure the following things are ready. Move the TV monitor to bottom left of the front stage facing the podium. Turn on additional microphones as needed. Bring the cajon and guitar wires to the Stage Box and connect. Work with the set up team to ensure microphone stands and music stands are on the stage. Please take note of The Well schedule below and stay close to the Control Panel to make necessary adjustments. Work with the pack up team to wrap all wires and return everything to its cases. Review the inventory for reference.